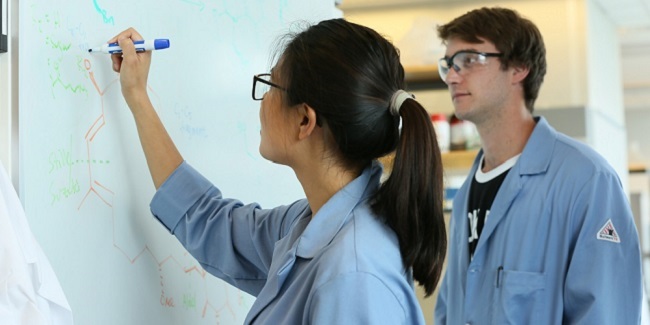 At Vanderbilt, undergraduates, graduate students, post-docs, and faculty work together and with other leading national and international scientists. We build intellectual relationships across disciplines—working with the College of Arts and Science, the School of Engineering, and the Vanderbilt University School of Medicine—with particular emphasis on chemical biology, structural biology, molecular toxicology, materials chemistry, and nanotechnology. Apply to our graduate program. "Developing Selective Reactions Under Mechanochemical Conditions"
"Biological 3D Printing: Strategies for Organizing and Interfacing with Model Cellular Systems"
"Synthesis of CTAP-3 Ligand for Signal Amplification"
"Age-Related Formation of DHA and DHB in Human Lenses and its Biological Consequences"